It may be September but don’t be fooled by the calendar – it’s still summer and many areas continue to be hot and humid! A refreshing Vietnamese-inspired noodle dish with crisp vegetables, fresh herbs and spicy pork is the perfect dish to cool down with. 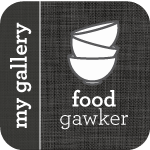 When I first started this site, just over three years ago, my goal was to present recipes with ingredients that were accessible to most people in North America, whether they lived in large cities or rural areas (like most of my family does). At the time, that meant that anything remotely exotic had to be excluded. However, over the past couple of years, even grocery stores in small towns now carry ingredients from around the world (well, not every small town, but the situation is improving in most places!). The ingredients for this recipe should be readily available anywhere with the possible exception of fish sauce (nuoc mam), rice vermicelli (banh pho) and oyster sauce. Any city with a large Asian population will have markets where you can buy these items; in smaller centers check the rice isle and condiment section (some stores also place imported items under ‘Ethnic Foods’). 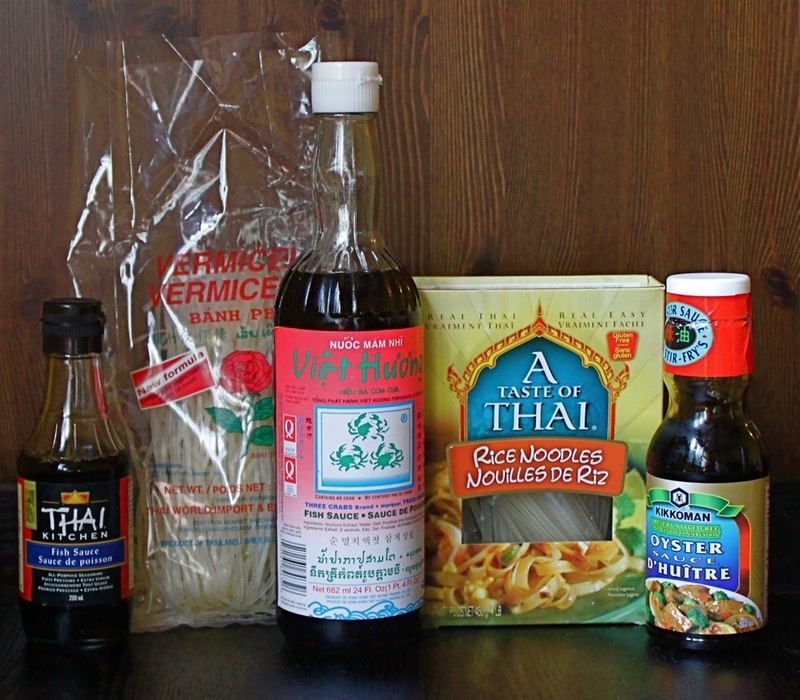 A Taste of Thai and Thai Kitchen brands are often carried in large supermarket chains. For substitutions, check out the Cook’s Thesaurus: Asian Condiments. Some Vietnamese and Thai pantry basics: (from left) Thai fish sauce, rice vermicelli (banh pho), Three Crabs brand fish sauce, Thai rice stick noodles, oyster sauce. Note: This recipe should be suitable for gluten-free diets, however, check the label of the fish sauce and oyster sauce to ensure that no gluten was used in their preparation. This recipe is a little long and requires a bit of prep work but it’s very simple if you take it step-by-step. You will need about three limes total for the juice and garnish. Be sure to use fresh herbs to garnish – they will make the dish come together. In a small bowl or measuring cup, add all ingredients and whisk until combined. Set aside until ready to use. In large skillet, heat the vegetable oil on medium-high heat. Add the ground pork and use a spatula to break it up. Cook for one minute. Add the garlic, shallot, chiles and lemongrass pieces. Stir into the pork until thoroughly combined. Cook the mixture until the pork is just past pink, about 5 to 7 minutes. Add the lime juice, oyster sauce, fish sauce, brown sugar and pepper. Stir to combine. Reduce the heat to medium and let simmer for another two minutes. Remove the lemongrass pieces and discard. Season the pork mixture with salt and set the mixture aside until ready to use. To prepare the noodles: Bring a pot of water to a boil. Drop in the dry noodles and cook for about 3 minutes or until just tender. Drain and rinse with cold water to halt the cooking. Place in a bowl and set aside until ready to use. To prepare the vegetables: Slice the cucumber into rounds, about 1/8“ thick. Discard the ends. Peel the carrots and cut into thin matchsticks and cut the red pepper into thin strips. Peel the shallot and slice into thin rings. Heat the oil in a small saucepan on high. Add the shallot rings and fry until golden and crispy, about 3 to 4 minutes. Make sure you don’t overcook them or they will become bitter. Use a slotted spoon to remove the rings from the oil and set them aside on a piece of paper towel. Sprinkle with a pinch of salt and set aside until ready to use. Place the softened noodles in a large bowl. Add the sliced cucumber, carrot and pepper strips and bean sprouts. Pour in the dressing and toss until everything is coated and thoroughly combined. Plate the noodles and top with the spiced pork. 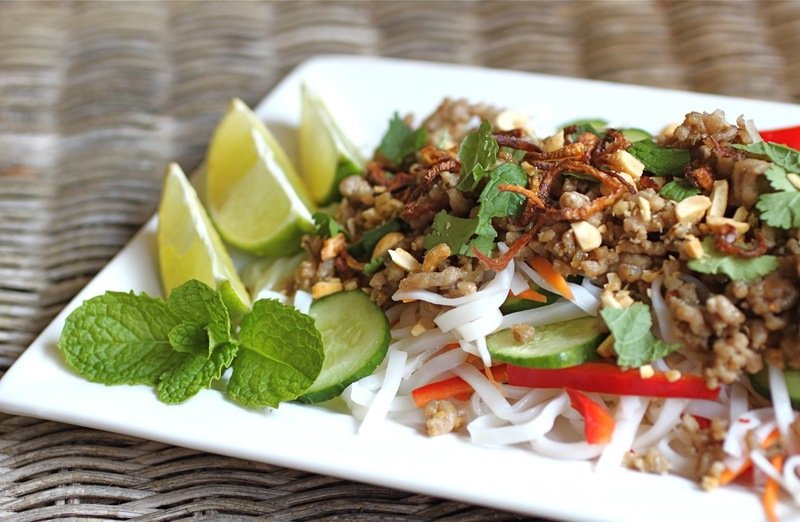 Garnish with torn fresh coriander and mint, chopped peanuts and fried shallot rings. Serve with lime wedges on the side to squeeze over the dish when served. The dish can be served warm or at room temperature. Get updates from The Seasonal Gourmet on Facebook and Twitter. Join the conversation today! Copyright Trish Coleman. Please contact the author to obtain permission for republication. Strawberry mojitos are very refreshing on a hot afternoon. The weather in Ontario this May has been incredible – unseasonably warm (hot even!) and very dry, which is unusual. It feels like it could be mid-July instead of the end of May. If this is any indication of what’s ahead, we’re in for quite a summer. When the weather heats up, naturally we look for ways to cool down. Iced tea, ice cream, lemonade and popsicles are just some of the treats that keep us cool. For many adults, enjoying some frosty beverages on a patio is the perfect way to spend a lazy Saturday afternoon with friends. I was at the farmer’s market this morning and local strawberries were abundant. There were also a number of vendors selling bunches of fresh mint. 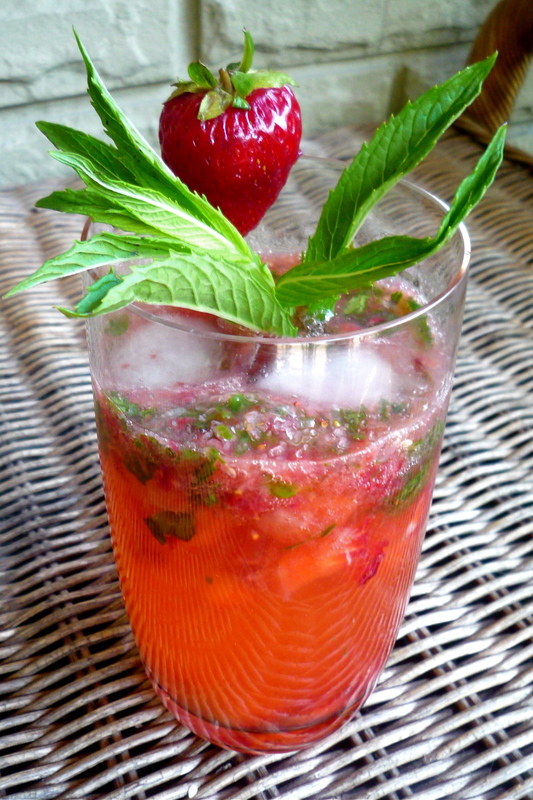 It was then that I had a light-bulb moment: hot weather + front porch + strawberries + mint = strawberry mojitos! A mojito is a Cuban cocktail traditionally made with rum, lime, mint , sugar and sparkling water. I first learned to make them while attending a wedding in Cuba. The resort we were staying at had a demonstration one day on how to make Cuban cocktails such as Mojitos, Cuba Libres and Hemingway Specials. The key to making a proper mojito is to muddle the mint well. There are wooden muddlers that you can buy but a wooden spoon will work just fine. Balance is important in this drink – you don’t want to venture into Girl Drink Drunk territory. Keep the sugar to a minimum and let the strawberries and lime add a sweet-tart note. To keep things easy, I use simple syrup to sweeten the drink instead of cane syrup or bar sugar (a quick dissolving sugar). It’s very easy to make and can be used in a number of cocktails. In a highball glass, add mint leaves and 1 oz. of simple syrup. Use a muddler or wooden spoon to mash the leaves in the syrup until they are broken up. Add the strawberry pieces and mash them with the spoon until they are broken up and juicy. Add ice cubes and pour in lime juice and rum. Stir until combined and top with club soda. Taste and add a bit more simple syrup if desired. Garnish with fresh mint leaves and a strawberry. Stir sugar until it dissolves. Remove from the heat and let the mixture cool before using. Syrup can be stored in the fridge for a few days. Extra syrup can be used in a number of other cocktail recipes.